Thanks to narrative media, the workplace scenario involving robotics or automation now depicts a picture of fear rather than of hope for the future. Though robots ganging up and getting to a point of mutiny is quite absurd and is something seen only in movies, fear of job cuts and an unemployed society is the real deal that is paralyzing most of the people. That robots will be taking over the majority of employment avenues in the near future cannot be entirely denied; however, the situation is not that grim. This is because Robotics is a dynamic field, and the career opportunities that it offers and will be offering in the future are many. Right from creation to the deployment of robots and robot parts, robotics has opened up the path for a myriad number of new jobs. The Swiss Think Tank in a BBC report predicts that robots will replace 75 million existing jobs but create 133 million new ones—an astoundingly positive prediction, right? But let us refrain ourselves from taking such a quick dive into the future and instead be a bit more realistic to see what robotics has offered to the current employment circle. Robotics creating more jobs is not a myth. For instance, a job crash due to automation would have made the headlines when the US automotive industry installed more than 60,000 industrial robots between 2010 and 2015. However, nothing of that sort happened, as the number of employees in the US automotive sector increased by 230,000 during the same period. Likewise, the German automotive sector increased the number of robots in operation to more than 93,000 units in 2015, and the same year saw the rise of 93,000 more jobs in the automotive sector of Germany. According to the global job site Indeed, India has witnessed a rise of 186% in the number of candidates seeking jobs in Robotics and a rise of 191% in job postings in the Robotics sector between 2015 and 2018. 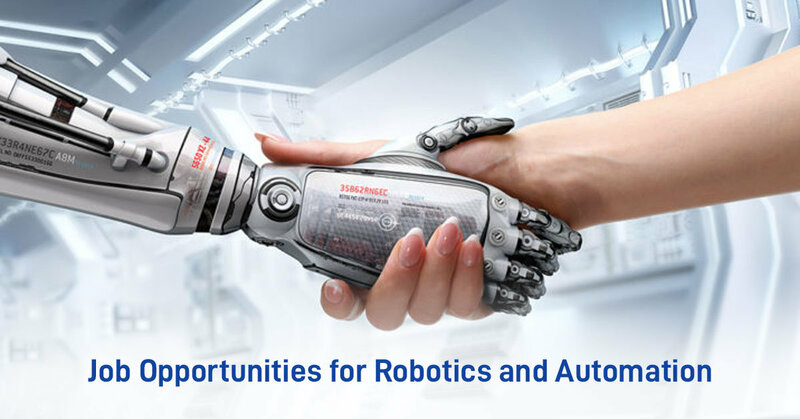 We will be discussing a few Job Opportunities for Robotics and Automation in this article. Hope you find the read insightful. The two most powerful career options that Robotics has brought about are those of Robotics Engineer and Robotics Technician. “Think of me as a personification of our dreams for the future of AI, as well as a framework for advanced AI and robotics research..,” says Hanson Robotics’ latest human-like robot Sophia. The creation of such an advance bot as Sophia itself is an extraordinary reminder of where the Science of Robotics is heading. Designing and creating such wonder bots require some serious engineering. Because robotics technology is a multidisciplinary subject, Robotics Engineers often have degrees in mechanical, manufacturing, electrical, electronic or industrial engineering besides Computer Science. According to the Federal Bureau of Labor Statistics, responsibilities of a Robotics Engineer include, “designing and testing a robot’s components; integrating the components to produce the final design; and evaluating the design’s overall effectiveness, cost, reliability and safety.” While some Robotics Engineers are involved in providing the overall design of the robots, others specialize in a specific area of robotics (such as artificial intelligence, vision systems and sensor systems) and are responsible for developing robots with “brains”, often called humanoids. In India, a Robotics Engineer can have an initial salary of Rs 3–4 lakhs per year, while in the USA the average salary for a Robotics Engineer is $80,000–100,263 per year. A Robotics Technician, on the other hand, helps the Robotics Engineer in installing, repairing and maintaining finished robots. He/she install different robot parts, such as actuators, peripheral and conducting devices, wiring, programs etc, thus helping in the initial installation of a robot. In case the newly constructed robot malfunctions, the Technician will disassemble the robot to locate faulty parts and correct them. The robot will then be reassembled and tested again; this drill continues until accurate results are obtained. Besides installation and repair, a Robotics Technician is also responsible for troubleshooting of extant robots and maintaining system documentation of the entire process. The difference between a Technician and an Engineer is their educational degrees and training. Robotics Technicians typically hold a 2-year Associate Degree in Robotics or a similar field, while Engineers require at least a Bachelor’s Degree in Robotics Engineering. Engineers often pursue higher graduate studies and professional engineering certification courses after their Bachelor’s Degree, while apprenticeship programs that provide on-the-job training along with classroom instruction are enough for a Technician. Robotics Technicians with a 2-year Robotics Associate Degree have an annual income between $26,000 and $35,000. However, with increased training and experience, the yearly income of Robotics Technicians may shoot up to $50,000 or more. A robot needs more than just metal and wire to be fully functional. What truly makes a robot operational is a computerized internal system called software. Writing and coding a foolproof software that helps the robot to carry out its assigned tasks in a safe and efficient way require a Software Developer/Engineer. Besides software development, a Software Developer is also responsible for creating a user interface that non-technical employees can use to set up the equipment. After designing and creating a robot, the next big step in line is marketing. Right from bringing in the finished robots to the market to closing off deals with customers, a Sales Engineer is responsible for the smooth conduction of the entire marketing process. He should have a good understanding of customer requirement, besides being extremely thorough with the built and nature of the product. However advanced a robot is, at the end of the day it is only a machine that runs on software. To supervise its functioning, a robot requires an Operator who keeps track of its every little detail. Hence, Operators should be mechanically inclined and be able to perform highly intricate and challenging tasks independently. They should have a thorough understanding of how robots work and what to do if a robot malfunctions. The other responsibilities of Operators are operating and repairing equipment such as flying drones, undersea robots, mining robots and robots designed for military activities. Robotics Account Managers lead and manage account strategy and focus on growth, profitability and customer satisfaction by devising current and long-term business plans. They are responsible for laying out proposals of sales target and ensuring successful implementation of the same. They also monitor competitors’ activity and develop response strategies accordingly. In short, they ensure that the company keeps on turning a profit and the customers remain happy. It is undebatable that the human mind is a wonder, and survival is the best instinct that man has been gifted with. Crises as terrible as natural disasters have been resolved with creativity and effort of man; so job cuts due to workplace automation will definitely have some answers. On a positive note, automation will make society powerful and not maim it. However, we need to take technological advancements more seriously and prepare ourselves for this wave of automation. Upskilling ourselves with the right set of training is what we can do, while providing the correct training is what the educational institutions and industry can do. Several Universities are now offering UG and PG courses in Robotics. However, the number of such Universities and Colleges need to be increased; this can be taken care of by the Government. Also, more emphasis should be given to the inclusion of Robotics in school curricula so that students get early exposure to the fundamentals of robotics. A strong and combined effort as this can help us harness the force of automation rather than being victimized by it.